The Qubit 4 Flurometer is the latest version of the popular Qubit fluorometer designed to accuray measure DNA, RNA, and protein quantity, and now also RNA integrity and quality, using the highly sensitive Qubit assays. The Qubit 4 Fluorometer was re-engineered to run the Qubit RNA IQ (integrity & quality) assay. The Qubit 4 Fluorometer and RNA IQ Assay Kit work together to accuray distinguish intact from degraded RNA in just two easy steps. For all Qubit assays, the concentration or quality of the target molecule in the sample is reported by a fluorescent dye that emits a signal only when bound to the target, which minimizes the effects of contaminants on the result. The easy-to-use touch-screen menus make it easy to select and run the assays you need, with results displayed in just a few seconds. The Qubit 4 Flurometer can also be used to directly measure the fluorescence of samples using Fluorometer mode. Additionally, Ion Sphere Particle quality can be evaluated on the Qubit 4 Fluorometer using the Ion Sphere Quality Control Kit prior to performing a sequencing run on the Ion PGM sequencer. 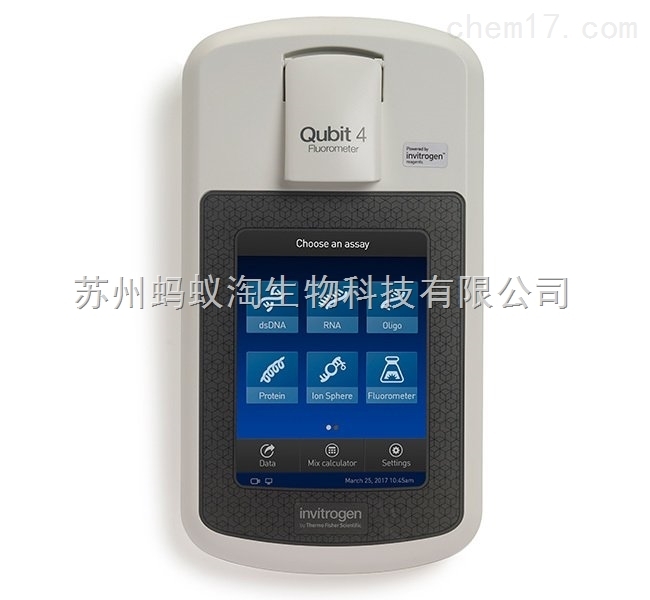 The Qubit 4 Fluorometer is far more sensitive than UV absorbance, which measures anything absorbing at 260 nm, including DNA, RNA, protein, free nucleotides, or excess salts. Moreover, UV spectrophotometry is often not sensitive enough to accuray measure low concentrations of DNA and RNA. With the Qubit fluorometer, your research is enhanced by more accurate measurements because the dyes in the Qubit assay kits fluoresce only when bound to the selected molecule (DNA, RNA or protein) in your sample. This allows you to avoid repeating work due to inaccurate measurements. The Qubit RNA IQ assay provides a fast, simple method to check whether an RNA sample has degraded. The assay utilizes two unique dyes: one that binds to large, intact RNA, and another that selectively binds to small, degraded RNA. Together they enable you to quickly assess the quality and integrity of an RNA sample. To use, simply add your samples to the RNA IQ working solution, then measure on the Qubit 4 Fluorometer. The thoughtfully designed Qubit 4 Fluorometer requires samples of only 1–20 µL. It is intended for use at room temperature and occupies only a small amount of bench space. The Qubit 4 Fluorometer features advanced optics and data analysis algorithms, and comes equipped with a USB thumb drive and cable for data transfer to Excel™ software and for software downloads, as well as a universal power supply, four plug adapters, and electromagnetic CE certification. This user-friendly fluorometer is combined with quick and simple assay procedures. Calculations and settings are automatically performed by the instrument. The Qubit assays for use with the Qubit 4 Fluorometer are all performed using the same general protocol, which uses a simple mix-and-read with incubation times of only two minutes for the DNA and RNA assays. 500 L thin-walled PCR tubes (Cat. No. Q32856) are required.